I got Willis from Petsmart along with his Orange Tabby brother, Bruce, when they were three months old. I'd never seen a cat like Willis before, but instantly, I thought he was so incredibly cute and unique-looking. 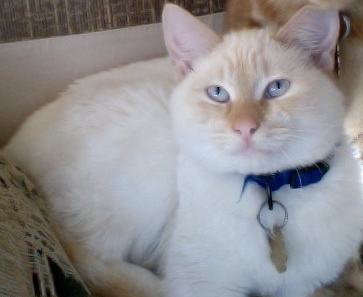 The lady who sold him to me told me he was a Flame Point Siamese. I'd never heard of that kind of cat before, but I thought I was lucky to have him. I wondered how he could be in the same litter with an Orange Tabby and how come he had tabby-looking stripes if he was still considered a Siamese. This website explained it all to me and it's really very interesting. Willis is now a year old and can be a little stinker and lets you come to him, like any typical cat, but he also loves to snuggle and sit in your lap. He likes to chase his tail and find things around the house to make his new toys. He's a very adventurous, sweet cat. Sarah, I loved these pictures of Willis and Bruce (great names, by the way!) 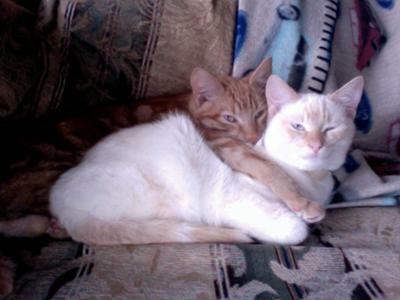 and it was fascinating to see a Flame Point Siamese with an Orange Tabby brother. The more I learn about cat genetics, the more the subject interests me. Willis is gorgeous with such absolutely beautiful eyes. 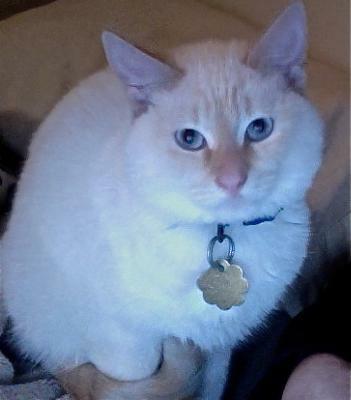 In general, in Siamese cats, the paler the point color, the paler the eye color, so it's not surprising that he has those pale blue eyes and they suit his coat and points perfectly. They're both so very cute (Bruce looks very mischievous in that photo of the two of them) and how lovely of you (and for you!) to have adopted two brother kittens. Thanks for sharing their story with us. We have the same brothers! I just adopted two little brothers. I was told they were part ragdoll, but they have short hair. One looks like a flame point Siamese, the other is an orange tabby. It’s fascinating. 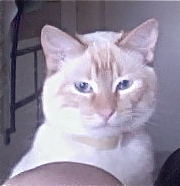 I also have a Red Point Siamese with the light blue eyes. He is the most gentle cat I have ever had. He is heavy in size as the Apple Siamese as he weighs almost 17 pounds. I adopted him after my son found him shot in the bushes behind his house. He is so beautiful and I would not trade him for anything. He loves to be loved and returns the favor, and is very talkative and active at night and gives out a ungodly howl now and then, and loves to play ball with you. When he wants something- he wants it now-not later. I just would like to say that your pics are beautiful! I was very happy to see that you have the same two kinds of cats that my family has! I'm with you when you said that it seemed so weird that the flame point cat (Casper..AKA Lover Kitty) and the tabby cat (Tigger...AKA Fat-Fat) could be brothers! But I do know for sure that they are brothers I was there when they were born :-)! Thanks for sharing!